Located south of the city of Cles, and within Trentino’s Val di Non, Tuenno was historically an agricultural community and is well know for growing apples, fruits, and vegetables. It is the second most populated village in Val di Non. A census taken in 1427 estimated there were 500 residents in the village. The population grew to an estimated 670 in 1751, 1620 (192 houses) in 1855, and 2143 in 1922. ALIPRANDINI — originally from the village of Livo, members of this family were elevated to nobility class in 1704. COMINELLI — originally from the village of Terzolas, members of this family were elevated to nobility class in 1747. CONCINI — a highly regarded family line believed descended from the Counts of Penna (Toscana), c. 1260. The family was divided into two main branches — those of Tuenno and those of Casez. Both branches distinguished themselves in military, religious, and political fields. .
SANDRI — members of this family were granted privileges and benefits of nobility in 1527 for services during the Rustic War. PINAMONTI — found in the village since c. 1425; two brothers were granted an insignia of minor nobility in 1530 for services rendered during the Rustic War. Also others such as ARNOLDI (c. 1528), BRUNI, COVA, DALLAGO (16th century),GASPERETTI (c. 1735), GHEZZI, MAISTRELLI (c. 1490’s), MENAPACE (emigration from Pavillo c. 1750), ODORIZZI (since 1500’s), PASQUIN, TRETTER (since 1700’s), VALENTINI (emigration from Rallo in the 1600’s). The name Tuenno is thought to be derived from the peoples known as “Tulliasses”. Axes from the Neolithic era, objects from the Bronze Age, and Roman tombs and coins have been found in the area. Over the centuries, the village name took many forms, including Tulen (in 1191), Tulleno (in 1291), Tuyen (14th century), Tuieno. The current form of the name has also been in use since the late 14th century. The village square, long a meeting place for the village residents, dates to the year 1592. A cholera epidemic in 1855 devastated Trentino. During the period 15 Aug to 19 Sept 1855, approximatley 195 people died as a result of this dreaded disease. The worst day was 22 Aug 1855, with 22 victims. Many of the victims were buried in a common grave, which today, is covered by fields. The first pharmacy opened during the epidemic. A monument to the memory of villagers killed in World War I stands in the Piazza degli Alpini. There were 52 casualties during the war, including 27 on the Russian front and 17 on the Italian front. 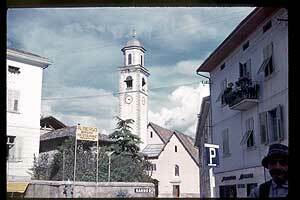 This entry was posted in Towns and Villages and tagged ancestors, family history, Trentino, Tuenno, Val di Non. Bookmark the permalink. Looking for the family of Emanuele Arnoldi born 1878, he came to America in 1900-1905. Believe his father was Nicholas Arnoldi and his mother was Giguiali PINAMONTI . I have his funeral card and family after he comes to Dennison, Tuscarawas County, Ohio. I will gladly share my info. Mon arriere grand père s’appellait Battista Leonardi , mon arriere grand mère Orsola Pinamonti . Ma grand mère Maria Leonardi . Affection à ma famille de Tuenno . It is interesting that a surname from Tuenno is Tretter. It is believed that the original bearers of this name were indeed from Tret in the upper valley. The surname developed in the 1700s to describe people originally from Tret who had settled in Tuenno. I don’t have any information about specific Odorizzi families. But take a family tree chart with you and visit the church and village hall. Someone there may be able to help you. Also try some small restaurants for leads. Often, when villagers see that you have family ties locally they are a lot more helpful.